The winner of last week's Great Wednesday Compare (Anne Shirley VERSUS Marilla Cuthbert), with a final score of 8-1 was Marilla Cuthbert. This is bizarre! I have to say, I did not predict that at all. 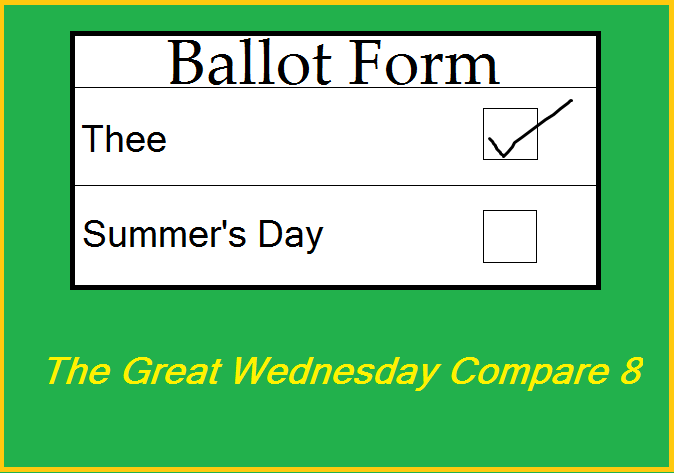 The winner of the Great Wednesday Compare #7, Marilla Cuthbert, beat the winner of the Great Wednesday Compare #8, Anne Shirley, and by a landslide. That both these women ended up on top in the first place is strange enough, but Mr. Miyagi beating the Karate Kid? I didn't see that coming. But I'm glad the final outcome still held a surprise for me. It's a good note to go out on. Yes, I'm retiring the Great Wednesday Compares. At least for now. I've done books, I've done bookish things, and I've done characters and I think I'm done. It's been a lot of fun and I love that so many people played along. Thank you so much. In the meantime, stay tuned for my next weekly feature: drawing Victorian authors in inappropriate poses! No? How about recipes based on the Earth's Children series? Maybe not. Timothy Findley impersonations? I've got nothing. Awe, so sad... Well, it was fun while it lasted. Wednesdays will never be the same. Though I was only an occasional participant, I did enjoy The Great Wednesday Compare. Thanks for them all. I bet Marilla beats everything - any book, any taker, ever. thanks for all the fun John. I know it was a lot of work, but it was appreciated. Again, thank-you to everyone for your kind words in this time of sorrow.